I mostly want to talk about what I liked and what I didn’t but I’m so short on time, so I am mashing the ladies and dance together here. It was quite difficult to find photos of all of these, so enjoy the videos! Bradie has sleeves! If you put your ideas of there, into the universe, someone hears you! I think the updated dress is an improvement for her and is more period too (unfortunately, I couldn’t find a better picture). Now we just have to work on that short program dress. I’m not a fan. I’m not usually into blue and black colour schemes, like a giant bruise. (Same goes for Polina.) I think she should have gone with one colour or the other. Choose! Really, overall, this is my issue with this dress (plus the gloves) – there is just too much happening. I do like the stripes around the waist though. It gives her definition and from some angles it gives the impression of a two piece. So, I think she should go top and bottom, sort of like Carolane Soucisse is doing in the RD. I think the two piece, mid-riff look would be good on Bradie. Or mid-driff top and long leggings. I think that could be good. Go for it, Bradie! Love Kaori‘s short program dress. I love the colour (I think it really suits her) and I love the design. I’m all in for this look. I really like the hair down too. I think she looks lovely. The free is nice but I like colour on this girl. Give her colour! I really like what Satoko is wearing in the free, despite the one sleeve, which is so strange for me. Let’s all take a moment to pause and watch the Tiny Queen. Of course, I like the short program dress too but the free is the super, I think. I like the splash of red. I sort of wish that Alaine was wearing the Sunset Boulevard blue dress from last year. I think the red is a great colour but I don’t know about the silvery-grey of the embellishment. It seems… retiring. I want it to be more diamond and gold or a matching garnet. But now that I’m looking at them side by side I’m not sure which is better. I am maybe leaning towards the red… or not. Marin is really going for ornamentation and it’s a bit excessive in places. I thought the black dress she was wearing for the short was good. Now the new red is okay (although I still think the black suited the program more) but I think the black puffy flowers on the back look sort of weird and are entirely unnecessary. Now that I know her music for the free program is from “House of Flying Daggers”, I’ve decided fine with the dress but there is a LOT going on and it’s hard to take it all in and appreciate it all at once. I just wish the lace in the sleeves didn’t look so stretchy. Laurine needs to make up her mind which colour she wants to wear in the free. I can see not reasonable explanation for being cut down the middle between grey and black. Pick one! I think Sofia‘s dresses are very appropriate for her programs and quite nice in the back but I do NOT like those rose glove thing she is wearing in the short. They are a bridge too far. In the free, I think the netting and sequins just make it feel disjointed and off-kilter. It feels like a distracting hodge-podge. I just think that whole look at ACI was so much better. Both dresses were simple and cohesive and flattering. They dresses expressed the character of the programs and she looked good. She had some allure. That’s a new thing for her! Go with the new look, Evegnia. Trust it. I also find myself questiong Wakaba‘s short program dress too, which although I think it is very cool, I just wish it made more sense. Wakaba also has an interesting dress in the free. The gold is quite subtle, almost flesh-toned which confused me a bit at first. (Am I suppose to see the skirt or not?) But, I decided that I like it. The beading is beautiful and I think it looks really nice on her. It’s a good costume change. I also just want to say, I’m sorry for doubting you, Wakaba. Now that I know you are dealing with foot issues, it explains everything. 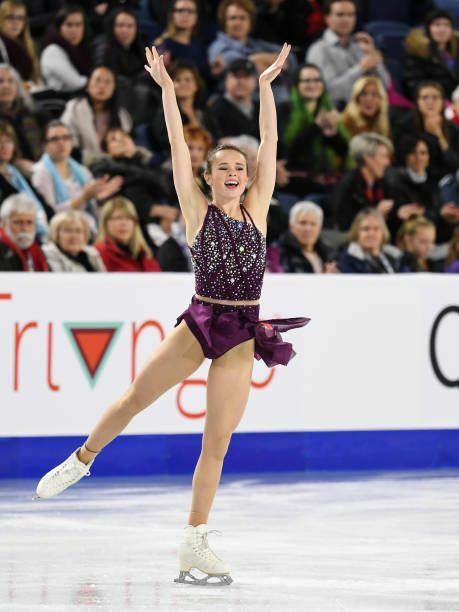 I’m cool with everything Starr is wearing but I sort of want her short program dress to have full sleeve sparkle, just all the more to enjoy the sparkliness. I really do like Elizaveta‘s long program dress but I’m not sold on the short. I feel like she’s got mixed up and put on the wrong dress and should be wearing it for another program instead. I sort of wish she was still wearing her leggings and top that she started with. Maybe a spy pantsuit? Oh please say yes! Elizabet is fine. I do not love nor dislike her dresses. They both work for the programs, so she gets a pass. Mariah, on the other, hand is sort of becoming a skating dress queen for me. I’ve loved her dresses (minus her first Maria outing last season) for the past three seasons. The sparkliness definitely helps. But in the short the burgundy colour is great on her and the dress makes structural sense. My eye and brain just accept it and love it. The free dance dress is quite nice too but it reminds me a bit of Ashley’s Wagner’s free dress a few years ago (Exogensis). I want Mariah to have something unique and all her own. So, the short is the real star. And now after watching the exhibition – first of all, beautiful dress; and second, can this be her free program? It suits her so well! I think someone should make it happen. One last word on the ladies because I have to mention Yura. I thought the white dress she wore at ACI was beautiful but the dress she wore here topped it. 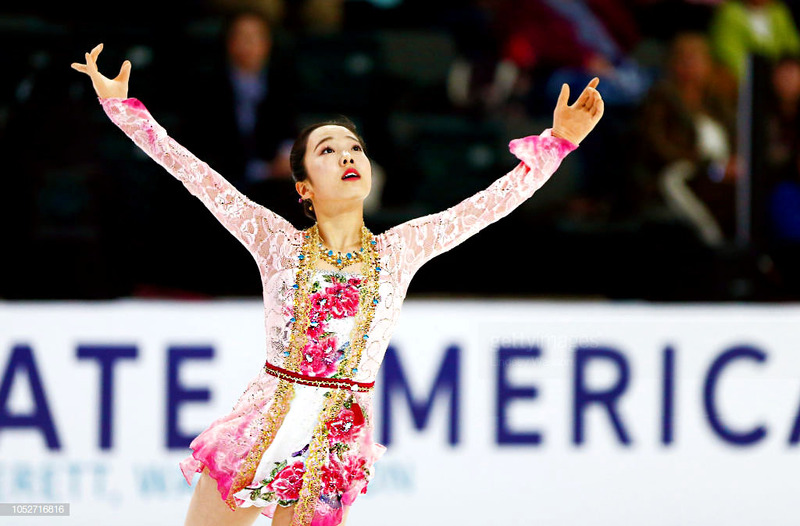 The detail on it is exquisite and just so, so appropriate for her program. Lovely, lovely, lovely. This was a hard one to find. We will have to do with a video from Rostelecom these days, following the youtube clear out of figure skating channels. It was a sad day.